Chair in the Shade: Favorite Color Swap Show Off! I told you yesterday that my swap partner's box had arrived. 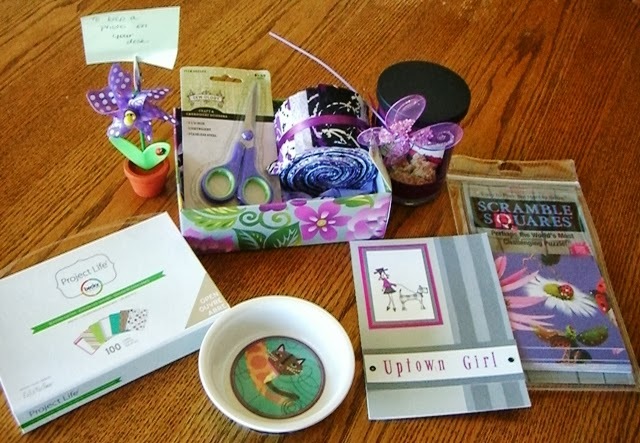 Let me tell you a little more about my swap partner before I show you all the treasures that were in inside.My partner was Cindy from A Crafter's Corner. She blogs about stamping and scrapbook and just life in general. You should check her out. 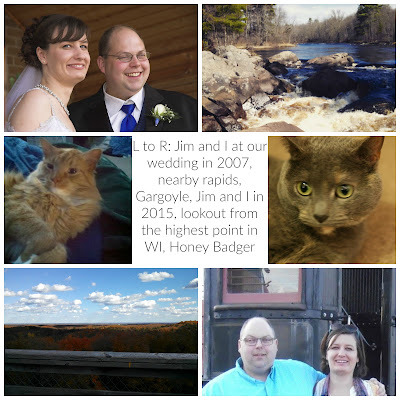 We exchanged an email kind of detailing what our hobbies were, what we do for a living, etc. And when, I got my box, I was totally impressed. She did awesome finding things that were me! I loved everything. Here's a picture. She sent this super cute card. 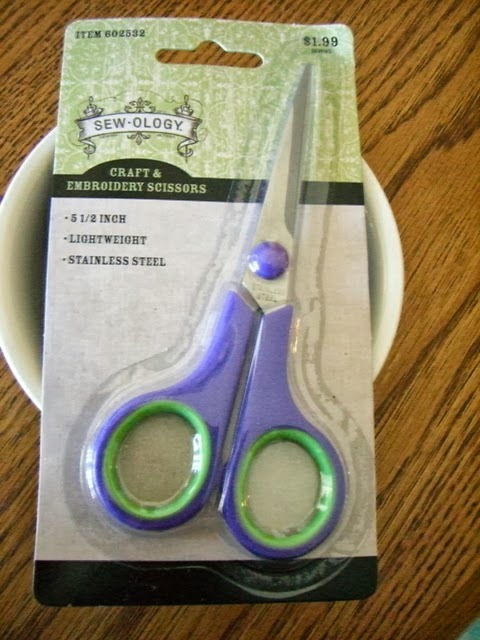 She's definitely a crafty chic. And then all these goodies. Project Life kit for seasons. 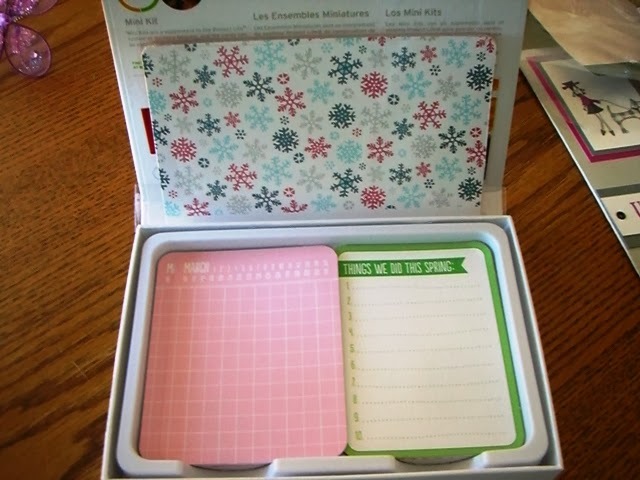 I told her how I was trying to use Project Life to be better about scrapbooking my photos so she sent this super cute kit. They don't make one in eggplant, or purple, but this will be uber practical and I love the patterns. 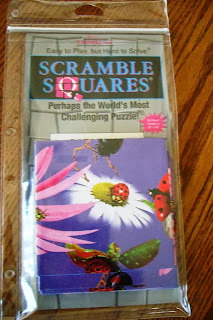 I love these little puzzles! 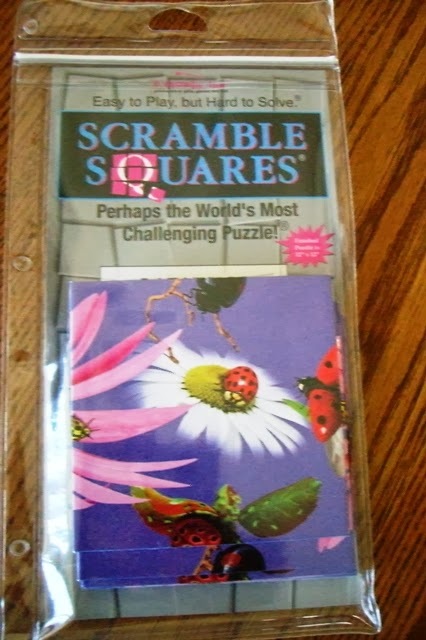 They make a square but you don't know which pieces are edges and you just try to match up the bugs on all sides. It's kind of like picture sudoku. A cute butterfly plant poke that HB loved. I couldn't even get a a clear photo of it because he kept trying to attack it. 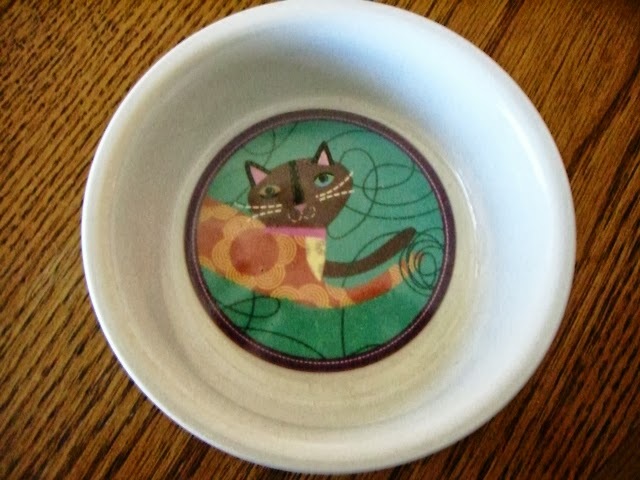 Super cute cat dish! I think I had some fabric with the same print on it about two years ago! I loved it. HB keeps sticking his head in the bowl like he knows there should be food in it. 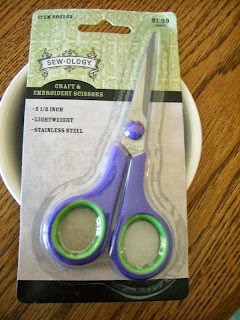 These are going to be super handy, because I have a tendency to use my fabric scissors to snip threads. Not a good way to keep them sharp. These are smaller and much better for the job. Plus they're sharp. 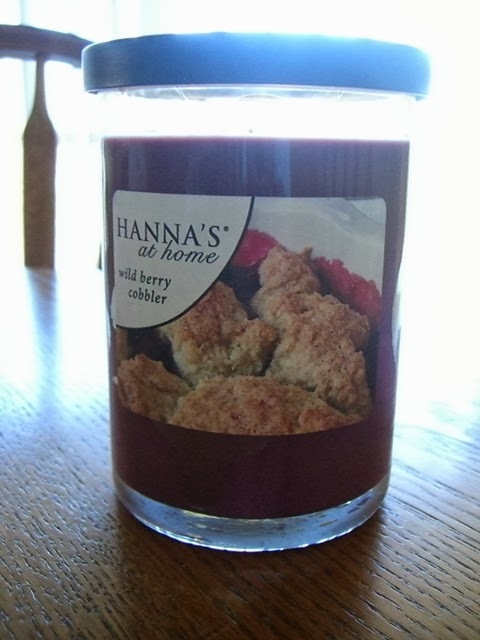 I love candles, and this one smells super nice. Food scented ones are always a hit at my house. 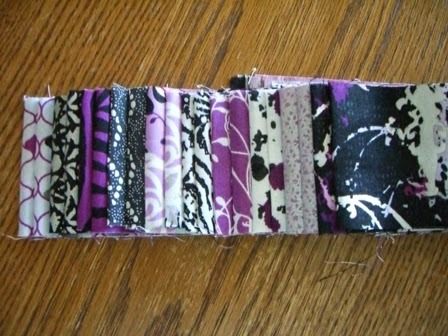 Absolutely gorgeous jelly roll. (I unwound it so you can get a better peek at the prints. I have never had a jelly roll before so I'm excited to make something out of it. Maybe something in a log cabin or ruffles! Not sure yet. And... one last thing. I didn't even get to photograph it before somebody had hauled it away. 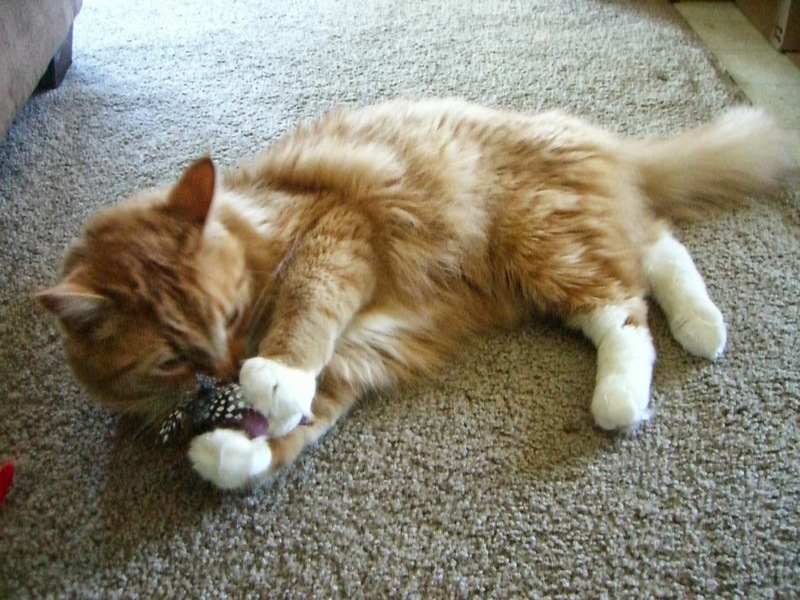 He loves the little eggplant colored, catnip filled bird. 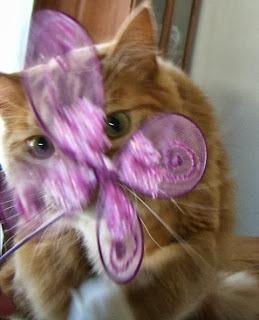 It has real feather wings and he likes to rub them on his face. He's a weirdo. But a happy one at least. 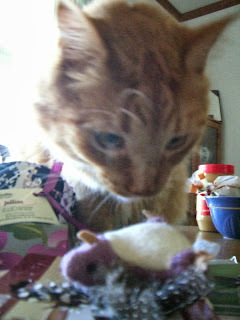 So, I'd like to thank Cindy for all the awesomeness and for making my weird cat happy! She's pretty great! I love all of your purple things. I never have seen a jelly roll. The fabrics are so pretty. There are lots of cute projects that call for jelly rolls, but I've never bought one and it always seems like to much work to cut my own strips. :) So I'm excited to try something new. This is a great package. I especially like the jelly roll. I've never heard of a Project Life kit; will have to check that out. And your kitty is adorable. Aubrey, I haven't gotten very far with Project Life, but what I like is you just pop your pictures into the protectors and use the cards to journal or just for decorations. 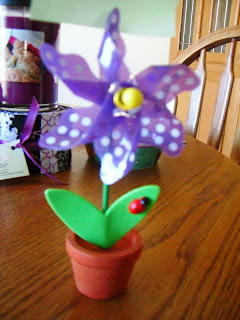 I figured I'd do better at that then at embellishing up scrapbook pages. Those are all so cute! So glad you loved your package, and thanks for playing along with us! Thank you to you and Beth for all the work you two put into these swaps. I've done two so far and had a blast both times! Beth, H is definitely a spoiled kitty. His sister is more camera shy and likes to keep to herself, but she did claim the food bowl. I put water in it and she growls at H if he tries to drink out of it while she is using it.